Frank "Lloyd" Wright (b. horse & buggy era – d. hula hoop era) was the world's most famous incompetent architect. Known for creating improbable buildings out of untested materials, he inflicted hundreds of unlivable houses, unusable office buildings, and frighteningly ugly landmarks on the gullible public. The hallmarks of Wright's architectural style are the leaking roof, the broken window, and the crumbling foundation. Along with Le Corbusier, he was key in changing the discipline of architecture from providing basic shelter for people into a series of passive-aggressive pranks. An example of Frank Lloyd Wright's early work before he parted ways with his brothers Orville and Wilbur. Note the way in which it has been designed to be in harmony with its surrounding, and yet provide a practical and livable space for its inhabitants. It was unable to fly, but only two people cared about that - Orville and Wilbur. Born in a barn in some God forsaken waste of space like Iowa or Wisconsin, young Wright apprenticed himself to the architectural firm of Gilbert & Sullivan. He soon began attracting attention for his flamboyant egotism, especially after his notorious affair with glamorous supermodel Ayn Rand and bellicose statements about being "a modern major general" able to design anything "animal, vegetable, or mineral". 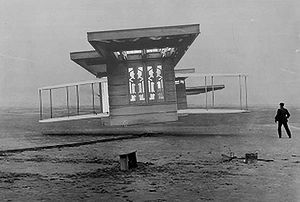 Wright's early work consisted of ruining the airplane designs that his brothers were coming up with. Wright was a champion of what he called "organic architecture", meaning buildings constructed of materials that would quickly rot and fall apart. Wright first triumph was the "prairie dog" school of design. Originally getting funding from investors who thought Wright would be building homes for prairie dogs, Wright actually built a tract of houses out of prairie dogs, using rubber cement to keep the still living squirming vermin in place. The architecture gradually became more "organic" as the rodents died and decayed. Run out of town on a rail, Wright retreated to the dessert where he built a studio for himself, "Taliban". At Arizona State University, he constructed a stadium for lesbian mud wrestling. Wright next created a series of office buildings out of radioactive fiesta-ware. All the ceilings were built to accommodate Wright's own diminutive 3 foot 8 inch (1.1 meter) stature. Many buildings designed by Wright were eventually destroyed by college students during fraternity hazings. Wright's most famous works from his senile phase are the Metropolitan Museum of Ugly Art in New York City, the Falling Down Stairs house in Tokyo, and of course his masterpiece, the mile high (1.1 meter) tall Alaska State House skyscraper, which, over half a century later, is still the tallest building in Nome, Alaska. Wright was resurrected in the '70s by President Gerald Ford, thanks to the Egyptian Book of the Dead. His first task was to design a new headquarters for the Department of War, that is, the Rhombicuboctahedron Building in Puerto Rico. After Jimmy Carter's inauguration, the President tried to block the construction of the Rhombicuboctahedron to no success. 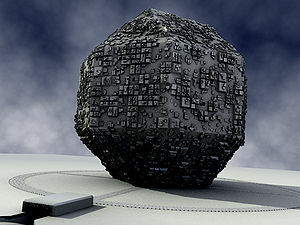 Carter eventually allowed the War Department to use the Rhombicuboctahedron in order to assist the Afghan rebellion against the Soviet invasion. 13 months later al Qaeda terrorists, presumably being trained to fight Soviets, ended up seizing control of the building. Carter ordered the War Department to surrender the building. Wright was overcome with malaise after this event, and according to most accounts he killed himself. According to other accounts, Wright is still alive and is the 'ghostwriter' behind the designs of the new World Trade Center and Freedom Tower. This page was last edited on 3 September 2012, at 06:32.